Booking directly on our official website you will not incur intermediation costs because you are speaking only to one organization, US at the Internazionale Domus Residence Rome. Booking, altering or canceling a reservation will be easy and immediate. No extra commission to pay, no intermediary and managing your booking is simple and immediate. 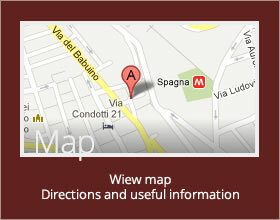 Booking directly on our official website you will always obtain the best rate available with our Guarantee!! In fact, if within 24 hours of booking, you find a lower price on other websites at the same conditions of purchase, we will bring the rate into line, and that is not all. Discover all about our Best Price Guaranteed. Booking directly on our official website your credit card is requested only to guarantee your booking, no money is charged to it. If you do not have a credit card, you can book with a bank transfer or PayPal. By Booking directly on our official website, you will have an unbeatable cancellation policy compared to other websites. You can reserve your stay at the lowest rate and cancel or alter your booking up to 14 days before your arrival without any charges. Booking directly on our official website you will always have a guaranteed upgrade (subject to availability). If at the moment of your check-in one is available, you will be offered a higher grade of room at no extra cost. Booking directly on our official website you will have the chance to leave your room up to 15.00 (subject to availability to check on the morning of check-out), as well as having the possibility of leaving your luggage in our deposit. 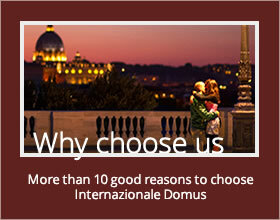 This is the official site of Internazionale Domus Residence Rome, all bookings are confirmed immediately; booking directly with us we will evaluate your requests to provide you with a made-to-measure offer, and you will also receive further information on how to reach us and what you wish to do while in Rome. We guarantee our quality through a careful selection and management of personnel, the team of employees work directly for Internazionale Domus Residence Rome next to the Spanish Steps and know the place and this magnificent city perfectly. That is why booking with us means getting lots of useful advice to help satisfy your idea of a vacation. Your booking is secure and the quality promised during your stay is guaranteed. Every image and description on our official website (www.internazionaledomus.com) is authentic: transparency comes first for us. No false descriptions or broken promises. You are also able to check the confirmation of your booking at any time. Booking directly on our official website you can find exclusive special offers only available on-line. You will also have the opportunity to become a part of our club and get a customer discount for your future stays as well as many exclusive benefits. 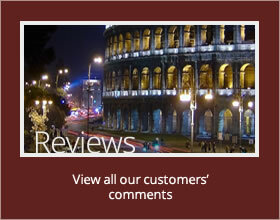 Learn all about Club Internazionale Domus Residence Rome. Booking directly on our official website you will be able to access our internet services free and unlimited throughout the entire establishment. In this way, both your smartphone and Notebook will be always connected at high speed. All information posted on our website and the data of your credit cards are safe, secure and inaccessible to third parties. GeoTrust Certificate Authority guarantees that the www.internazionaledomus.com site forwards the data securely.